Preview the 2012 Employee of the Year below. Thank you for this wonderful opportunity! I greatly appreciate all you hard work and effort in helping me obtain employment. You made my job search process easy and painless. I am excited by this new venture and look forward to the challenges and opportunities that await. Thank you again for you confidence and I will be sure to contact you should I have any further questions. I am very happy and pleased to have been given this opportunity to work for and represent SSOH. As a former, internal staff member of Staffing Solutions of Hawaii, there was no doubt in my mind where I should go when I found myself looking for employment. Lisa and Alyson got right to work with submitting my resume to their client pool and within a week I had several job interviews. I was chosen for a Human Resources assignment with one of the top employers in Hawaii and enjoyed every day of my assignment. I highly recommend the attentive staff at Staffing Solutions of Hawaii and know they will do whatever they can to get you a great fitting assignment! Thanks Ladies for all your hard work! I continue to be impressed with prompt, professsional follow up service to any questions or concerns. My overall experience with the staffing team at SSOH, I would rate as a 5 – Excellent! SSOH is very Professional. They offered training to enhance our skills, and they were really nice. I had the privilege to work with Jihan, and she was really persistent in finding a job for me. I recommend SSOH to anyone who is looking for a good career. Thank You SSOH! Both the team at Staffing Solutions of Hawaii and their client treated me with respect. My staffing recruiter at SSOH followed up with me regularly about my assignment and feedback from the client on my performance. Your team has been terrific, and I've appreciated all of your support and assistance. I wish each and all of you continued success and much joy! Staffing Solutions of Hawaii is a wonderful organization which is professional with a friendly atmosphere. I walked in for an interview on a Friday afternoon and was able to begin my new job Monday morning. They are fast and efficient while thoroughly interviewing and screening potential employees. I highly recommend using them to find employment opportunities. When I came to SSOH I was a recent graduate from UHM and I needed a job badly! The staff treated me with the greatest professionalism I have ever experienced here on Oahu. The managers were always able to answer my questions quickly and effectively. The staff really searches for the best job fit and will continue to help you even after you've been placed somewhere. SSOH will help you find your way through this tough job market and economy. I always know that I can go back to them at any time, even while still placed with another employer. Staffing Solutions always has Aloha, gives and shows Aloha and works hard for the people of Hawaii. We are proud of our expert employees working at Staffing Solutions. Each year, we honor one of our employees with our prestigious Associate of the Year designation. SSOH’s staffing team looks for someone who has displayed ongoing, outstanding Attitude, Dedication, Responsibility, and Growth. We are proud of the expert employees working at Staffing Solutions. Each year, we honor one of our employees with our prestigious Associate of the Year designation. SSOH’s staffing team looks for someone who has displayed ongoing, outstanding Attitude, Dedication, Responsibility, and Growth. How does this employee embody one or more of the staffing industry's five key messages—jobs, flexibility, bridge, choice, and training? Upon being introduced to Sheldon, our staffing team was immediately impressed with his professional demeanor and extraordinary skill level. Staffing Solutions of Hawaii takes great pride in knowing we are matching contingent employees not just into a workforce ‘Job’ but full time career opportunities. Our team recognizes that with hardworking, dedicated employees such as Sheldon, we are working to make a difference in his chosen field of interest. Starting the assignment working full time hours since beginning his contract, Sheldon has been able to take full advantage of a ‘Flexible’ schedule. Working to ensure all of his projects are done on time and above expectations, his contingent hours have allowed for him to spend quality time with his family. Sheldon is a dedicated professional who embodies the ‘Choice’ key message! He has chosen to commit to a long term assignment as an Administrative Assistant with Hawaii’s Naval Support Department. Through a recent in person quality check touring the facility he manages, we witnessed first-hand his passion for this assignment. Our team became quickly aware he chooses to work this job out of compassion and care for what the employment opportunity has provided him. By choosing to work this challenging assignment, he has developed new skill sets and taken full advantage of ‘Training’ to make him a more qualified, skilled worker. 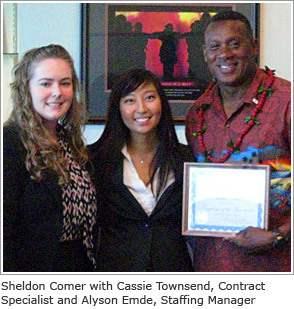 During the last year of working with Staffing Solutions of Hawaii, Sheldon has had perfect attendance. Asked about his quality of work, his Naval Commander responded “We love Sheldon, just keep him happy”. If government funding allows, Donnie has certainly set up the ‘Bridge’ for being hired as a full time permanent employee. He is regarded as a true professional not only among our company but also by his peers at the Naval Support Department. "I began working at SSOH in 2011 at one of the company’s remote government contracts for the Navy. I am a retired Marine working on a Navy contract; this was an initial concern of mine working for a civilian company. I was unsure SSOH would understand the culture of their client and me as an employee. To my surprise SSOH has been more than up to the task. SSOH is a civilian company that can adapt and understand military culture along with meeting the precise needs of their employee; this was impressive. Most people think of benefits in terms of vacation time, health care and dental. But working with the military, you have to think in terms of family / Ohana. SSOH has made me feel like Ohana. I have recommended SSOH to several of my friends. I am more than impressed with this company’s performance and support but even more so with the treatment of their employees. SSOH, communicates with me regularly and really does have that Aloha feeling. The staff is friendly, professional and you do not feel like a stranger. It is impressive and touching that when you walk into the main office, not having been there for a few months, the staff knows you by name. They are courteous, helpful, professional and friendly. This job has allowed me to continue to support the Troops, something very dear to me, and SSOH has a congruent sentiment. One of the biggest surprises while on assignment last Christmas, Cassie T. my recruiter, shows up in reindeer antlers with Christmas cookies. That is what Ohana is all about! Mahalo Nui Loa to my SSOH Ohana."